Date Sugar makes yet another appearance and does not disappoint - if you don't have date sugar you can absolutely use pure maple syrup. 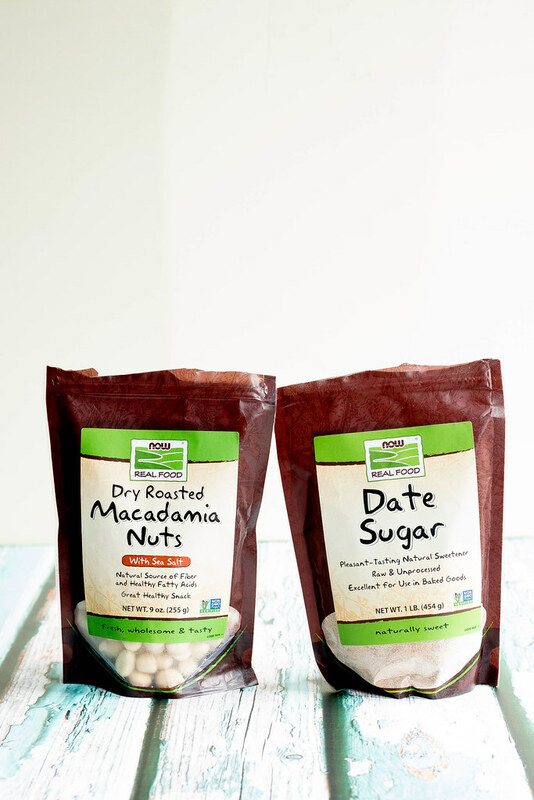 I love the macadamias but almonds would also work really well with the Strawberries. 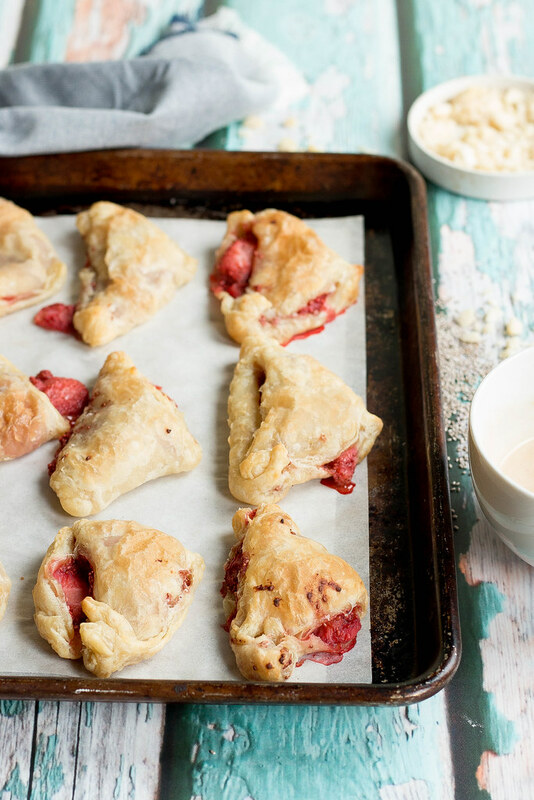 I can hardly believe it is almost strawberry season! Our local strawberries start popping up around mid June - the strawberries at the store are looking pretty fine and they taste good, but nothing beats locally grown. 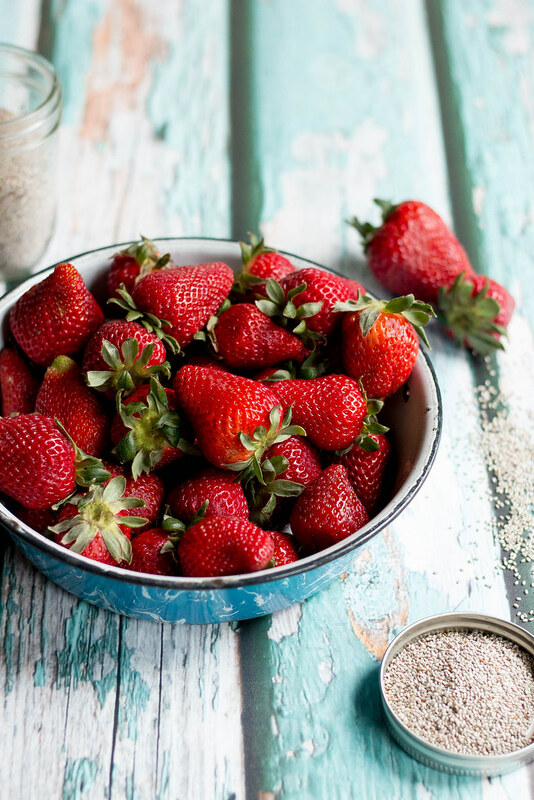 A quick jam is made in about 10 minutes with strawberries, chia seeds + date sugar. 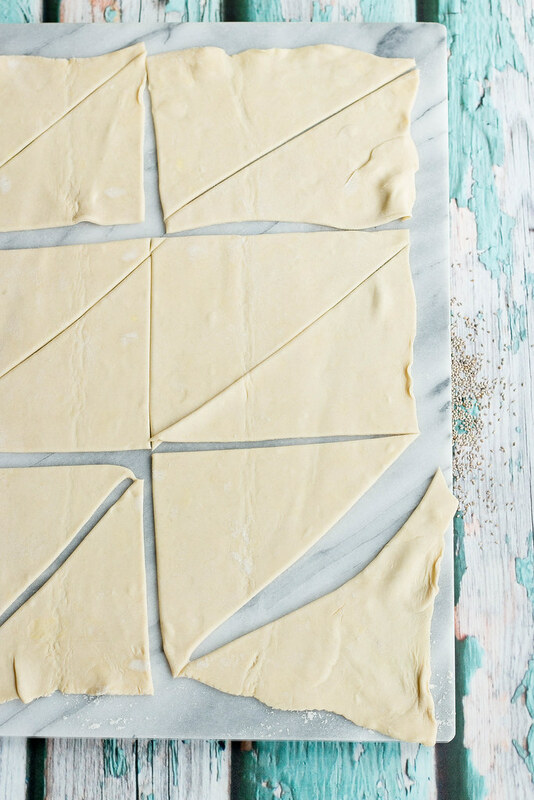 Store bought vegan puff pastry is your secret weapon. 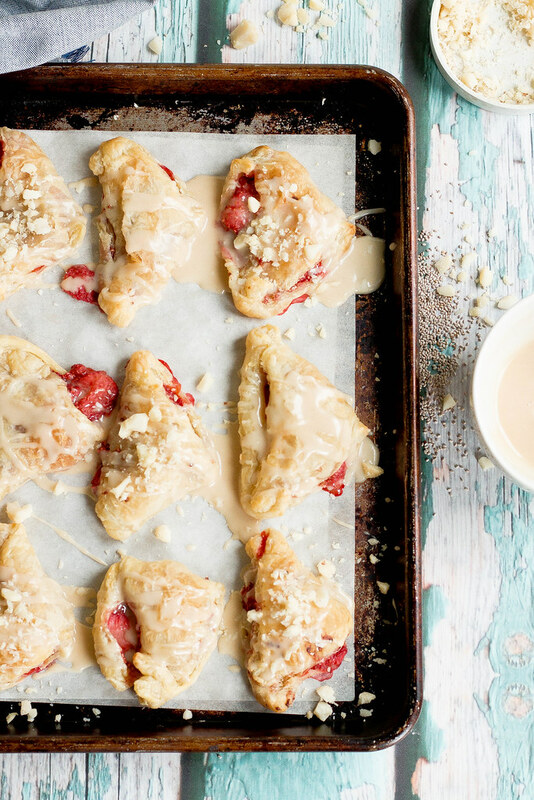 A simple glaze of tahini and maple with powdered sugar is drizzled over the cooled pastries, then topped with chopped Macadamias. 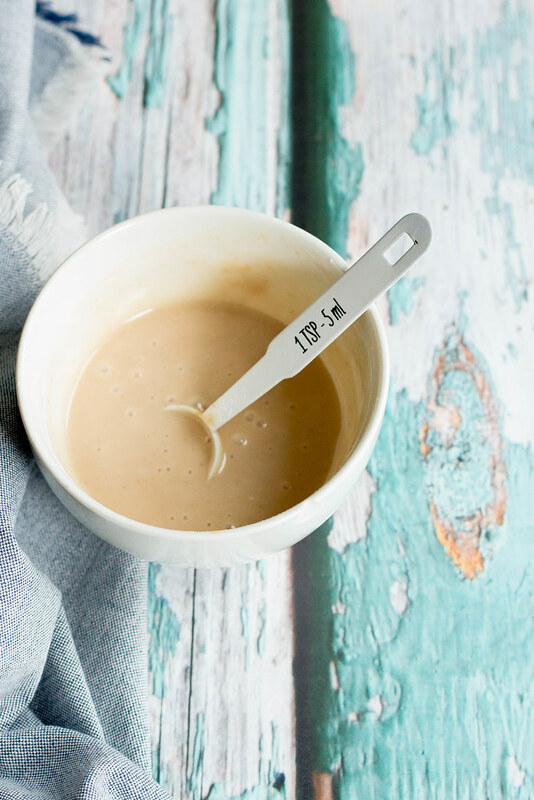 Perfect with a cup of tea - just a tad sweet, however consider yourself warned // the tahini maple glaze is super addicting...I may or may not have poured the leftover drizzle straight into my mouth. Wanna a chance to win a product bundle from NOW? 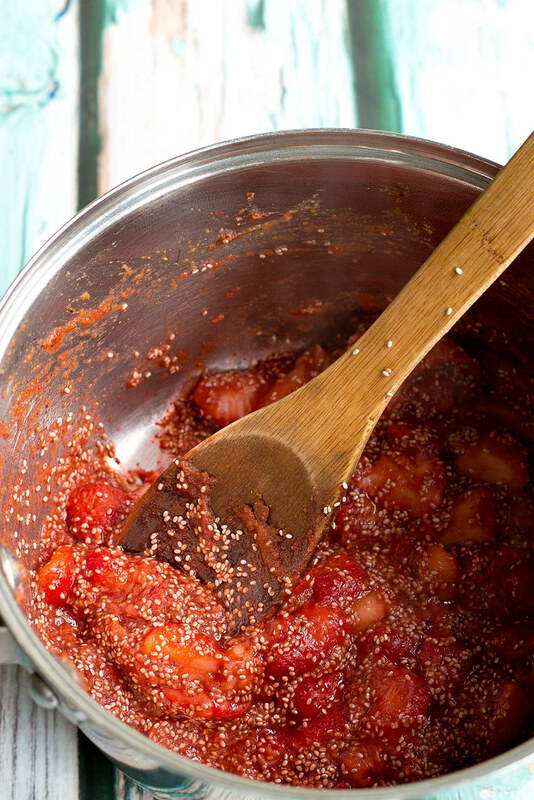 In a sauce pan over medium heat, add quartered strawberries, date sugar + water. 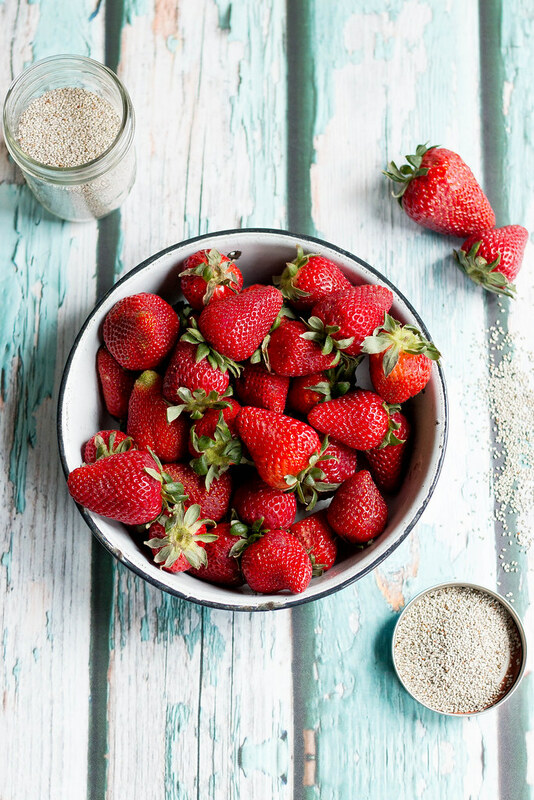 Bring to a simmer, stirring and breaking up the strawberries with the back of a wooden spoon, Cook for 5 -8 minutes until berries begin to breakdown- you still want some of the berries to hold shape. 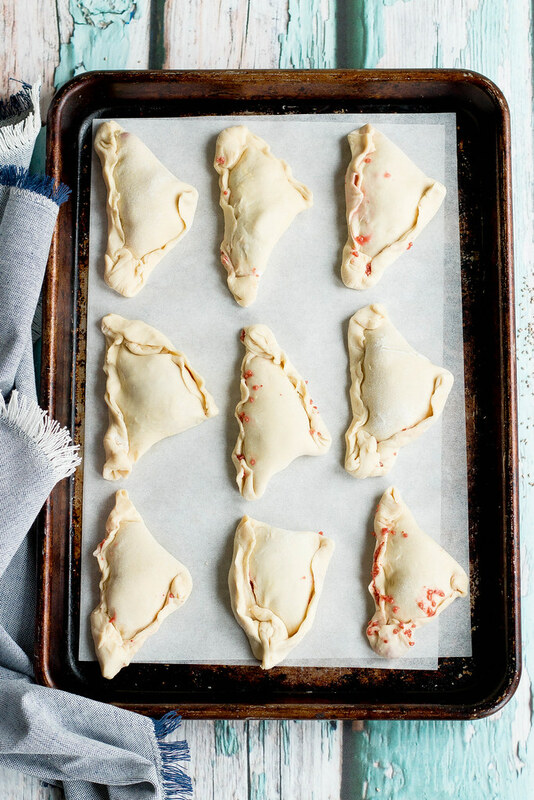 Remove from heat and stir in chia seeds, set aside to cool while you prep the puff pastry dough. 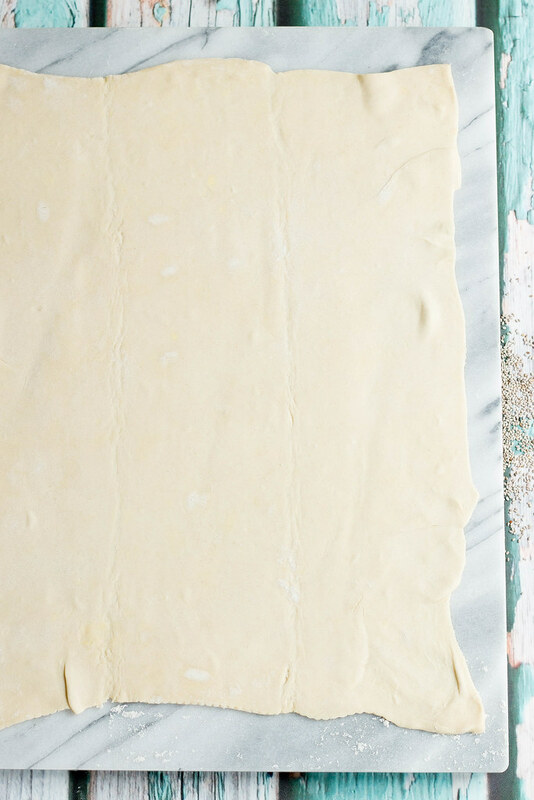 On a well floured surface roll out 1 puff pastry sheet to a 14" x 11" rectangle. 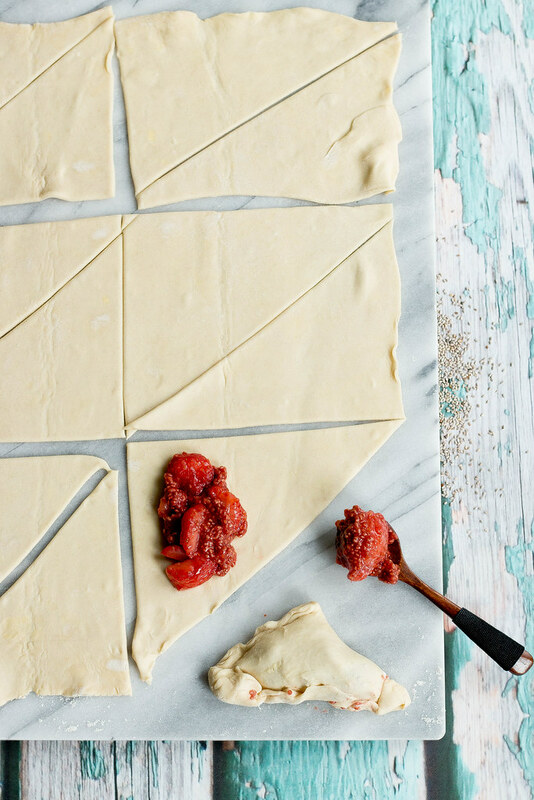 Using a pastry cutter or knife cut the rectangle (the long way) into 2 halves. Cut into 6 squares. The cut each square into 2 triangles. Place about 1 tbsp or so of the jam onto onside of the triangle. Fold over meeting corner with corner creating another triangle. Fold the 3 sides up sealing each side (see photos). Bake in preheated oven for 12-15 minutes until puffed and golden brown. To make the drizzle, mix all ingredients in a bowl until smooth and creamy. 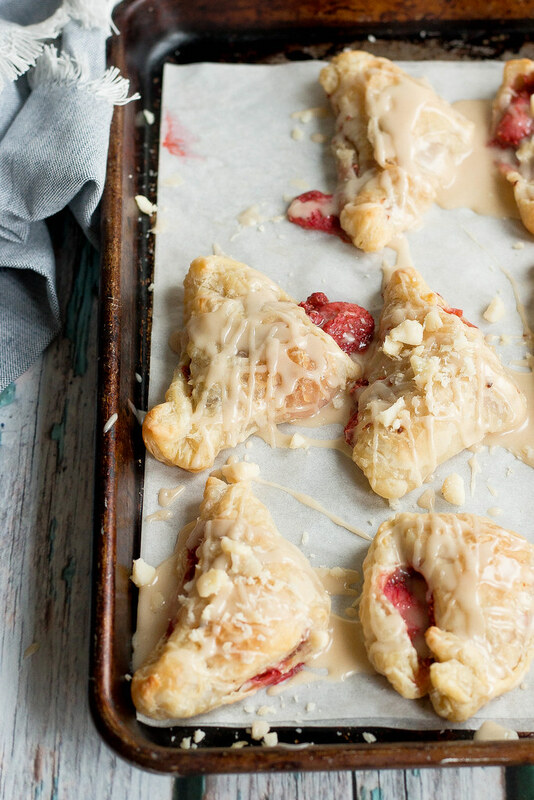 Drizzle Maple Tahini over the cooled pastries and sprinkle with chopped macadamia nuts. Serve the same day + store leftovers in the Fridge. 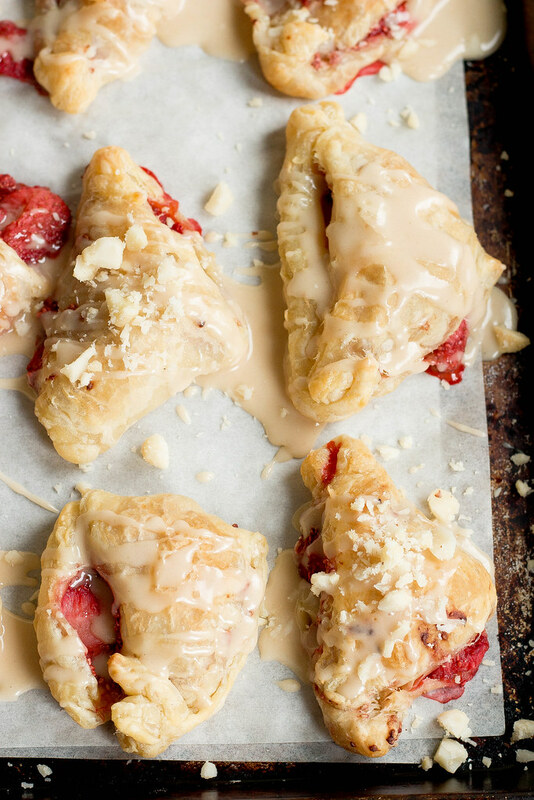 Your turnovers are so pretty, and I like that you used packaged puff pastry for sake of ease. For a quick and easy dessert, I'm always satisfied with a hot batch of chocolate chip cookies. My go-to quick and easy dessert - date rolls with coconut (dates, water, shredded coconut). Super easy and super satisfying! My go-to easy dessert for just myself is usually banana nice cream. Or if I'm feeling a lil' fancier or have other people around, I'll make a quick mug cake or brownie. Wow these look incredible!! Where did you buy that spoon from? !